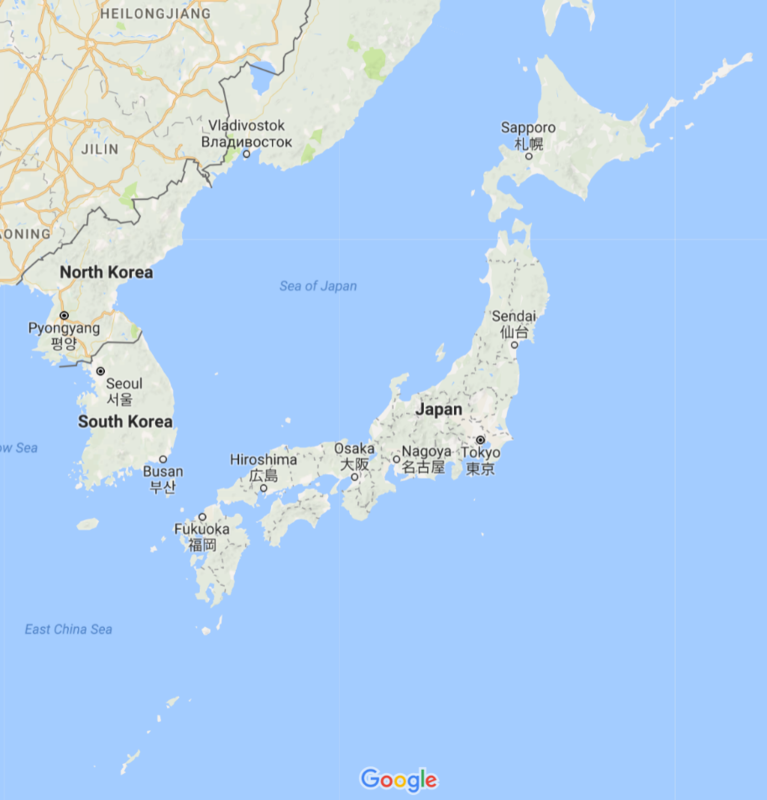 JAPAN is an island country, located west of the Pacific Ocean in the Northern Hemisphere. The major islands are Hokkaido, Honshu (the mainland), Shikoku and Kyushu. The Ryukyu Islands, which include Okinawa, are chain to the south of Kyushu. There are 6,852 islands in total. Japan consists of 47 prefectures. Each prefecture is divided into cities, towns and villages. The population of 127 million is the world’s tenth largest. Japanese people make up 98.5% of Japan’s total population. Life expectancy at birth is 86.99 years for women, and 80.75 years for men (2017). The population is ageing. 26.7% of the population is over 65 years and 12.7% of the population is children under the age of 14 years (2017). The culture of JAPAN has evolved over the millennia, from the country’s prehistoric Jomon period, to its contemporary modern culture, which absorbs influences from Asia, Europe, and North America. Traditional Japanese culture include crafts such as ceramics, textiles, lacquerware, swords and dolls, performances of bunraku, kabuki, noh, dance , and rakugo, and other practices, the tea ceremony, ikebana, martial arts, calligraphy, origami, onsen, and games. Traditional Japanese culture has many roots in Chinese culture, however Japanese culture, even historically differed from Chinese culture. This differentiation of the cultures is due in part to the separation of the two land masses, plus Japan’s periods of enforced isolation from the outside world, further extended the differences between the two cultures. Japanese is the primary language of Japan. Japanese is written with a combination of three scripts: hiragana, katakana and kanji. In Japan, everyone has public health insurance. The health insurance systems that workers subscribe to include Health Insurance managed by the Health Insurance Society, which consists of the employees of enterprises, and the Japan Health Insurance Association- managed Health Insurance, which diversifies the risk using payments from all the workers of small- and medium-sized enterprises. In addition, National Health Insurance is a health insurance system that is operated by municipalities, etc. and to which people who do not have any other insurance plan subscribe to. Furthermore, people aged 75 or older subscribe to the late-stage medical care system for the elderly. People’s health and lives are protected by the universal health insurance system that benefit from having established a society in which everyone can receive high quality medical services at a certain cost regardless of their income or type of work. Recently enhancement of nursing services has been required to meet the advanced and diversified healthcare, the aging society with fewer children, and the diversified citizens’ needs. In 2009, amendment bills for the Act on Public-Health Nurses, Midwives and Nurses and other laws by lawmaker-initiated legislation gained approval for the first time in 60 years. The main amendments are specifying graduation from a 4-year college degree for eligibility to take the nurse’s examination, revising the course terms of public health nurse and midwife education, and providing obligatory newly-graduated nursing personnel training. In 2015, the partial amendment of the Act on Public Health Nurses, Midwives and Nurses was enforced. It expanded the role of nurses who took specific training to practice medical interventions. There are several courses of basic nursing education in Japan. In the main courses, basic nursing education is provided at 4-year colleges/universities, 3-year junior colleges or 3-year training schools after graduation from high school to take a national examination to obtain the national license. Education for public health nurses and midwives is provided at colleges/universities, one-year colleges or training schools, and master’s programs at graduate schools. If a 4-year college/university education includes a training program for public health nurses and/or midwives, graduates can qualify to take the national examination, not only for nurses, but also for public health nurses and/or midwives. In Japan, the qualification of public health nurses, midwives, nurses and assistant nurses is stipulated by law, while the certification of specialized nurses is not specified by law. Although many organizations and societies certify such personnel, credentialing system by JNA (Japanese Nursing Association) is socially recognized and evaluated. This credentialing system by JNA, intends to offer quality healthcare to citizens and the following three certificates; certified nurse specialists (CNS), certified nurses (CN) and certified nurse administrators (CNA). The progress has been made in genome research and cytogenetic studies, such as the identification of responsible gene mutations, the discovery of onset mechanisms and the development of remedies. In this manner, genetic tests/ diagnoses have become one of the most important medical practices for physicians of all specialties. Meanwhile, special attention needs to be taken in handling genetic information. The Japanese Association of Medical Sciences (JAMS) states that genetic counseling should be performed at an appropriate time when necessary. Also they mentioned genetic counseling is not only to provide information, but also to take psychological and social support into account so that the patient/client can autonomously make a decision. Therefore, it is desirable that the attending doctor with clinical experience of the disease cooperates with experts in genetic counseling, and they collaborate and practice as a multidisciplinary team. In 2002, the system of Clinical Geneticists began. In 2005, the system of Certified Genetic Counselors (Non-physician) was established. There are 1301 Clinical Geneticists and 205 Certified Genetic Counselors qualified by the Japan Society of Human Genetics and Japanese Society for Genetic Counseling (2017). Almost 70% of genetic counselors are working at medical institutions. Nationwide meetings of Department of medical genetics have held since 2003 and 114 medical institutions which have a Department of medical genetics are registered. However, genetic counseling is not a treatment covered by public health insurance. In 1999, Genetic Nursing Committee in Japan was established which expanded into The Japan Society of Genetic Nursing in 2005. Seven areas of competency of genetic nursing practice in Japan are listed: 1) identifying client’s needs, 2) helping clients to understand their conditions and characteristics, 3) psychological support, 4) provision and exchange of appropriate genetic information among health care providers, 5) daily living support, 6) reference and collaboration with other institutions, and 7) professional development. Furthermore, they identified competency of nurses who specializes in Genetic Nursing (Advanced Level practice) as 4) provision and exchange of appropriate genetic information among health care providers, 6) reference and collaboration with other institutions and 2) helping clients to understand their conditions and characteristics (Arimori et al. 2004). In November 2016, the Japanese Nursing Association authorized “Genetic Nursing” as a new field of certified nurse specialists (CNS) in Japan. The Japan Society of Genetic Nursing will lead efforts to develop and support the new role the “Certified Nurse Specialist in Genetic Nursing”. The expected role includes the following: 1) Advanced practice (including identifying problems based by genetic assessment and dealing with the genetic/genomic problems), 2) Consultation, 3) Coordination, 4) Ethical consideration, 5) Education, and 6) Research. The Japanese Society of Genetic Nursing is a professional association founded for the purpose of defining the nurse’s role in genetic medicine, and developing and advancing the quality of genetic nursing services.